Highway To A Neon Valhalla is a 3D splitscreen racing game created for Train Jam 2017. Your goal is simple: get more points than your opponent before the game ends. Unfortunately, neither player knows how to actually get points. There are three different kinds of pickups to collect, but only one of them gives you points; the other two either do nothing or make progress towards causing the game to end. Which pickup does what is randomized at the start of every match. 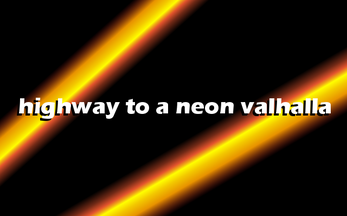 Will you collect enough of the right pickup, or will your opponent reach a neon valhalla first? This game requires two controllers to play. Headphones are recommended. Highway To A Neon Valhalla was developed by Alic Szecsei (http://aszecsei.itch.io | @aszecsei) and Tom Rismeyer (http://trismeyer.itch.io | @TinyTom_99).